Foxes are contrary creatures. They have suffered centuries of persecution, yet are one of the nation’s most beloved native animals. Literature and culture presents them as the trickster, cunning and wily, but also as helpful and wise. Disney’s foxy Robin Hood steals from the rich and gives to the poor, whilst Roald Dahl’s Fantastic Mr Fox steals chickens, turkeys (and cider). Reynard, the fox of Dutch mythology, deceives his fellow creatures for his own gain, whilst in The Hounds of the Morrigan, Cooroo the red fox risks his life to protect children being chased through a snowstorm by an enchanted hunt. The red fox (Vulpes vulpes) is our only wild canine species, relatives of the domestic dog and wolf. Foxes are historically associated with countryside and woodlands, but in fact thrive in almost all habitats. Their reputation for cunning is borne of this impressive resourcefulness and adaptivity. They have embraced Britain’s growing urban sprawl, and you are just as likely to spot one having a rootle through a downtown bin than you are to see one trotting through the wood. They live in underground dens, known as earths and are only marginally larger than the domestic cat. Foxes live in social groups, sharing territory that they meticulously precision scent mark by employing a variety of positions when they urinate. Their social group typically consists of a family, but in bountiful habitats some subordinates can make up part of the group. They mate in winter and the vixen will have one litter of pups a year. The average litter size is 2-6. Foxes are generally monogamous and the dog fox will hunt and provide food for the whelping mother and later, their offspring. Foxes are loyal and protective caregivers. In 2009 a story was widely reported about a fox cub that was caught in a snare. It was discovered two weeks later, and survived because its mother had repeatedly returned to her cub to provide it with food. Widely thought of as carnivorous hunters, it may surprise some to learn that foxes eat berries, fruits, sedges and grasses besides mice, rabbits, squirrels, birds and the like. They scavenge as well as hunt. One of the reasons they have adapted so well to urban environments is because they eat food humans have discarded. Foxes are famed for their beauty. They have delicate, long snouted faces with soft amber eyes with feline-like elongated pupils. They are one of the most dashing inhabitants of the Wildwood, clad in coats of luxuriant orangey fur, with a striking white flash running from their muzzle to their underbody. They generally have black socks. Their most celebrated and arresting accruement is surely their beautiful long and bushy tail, or brush. Brushes can be tipped with white and tinged with black fur. 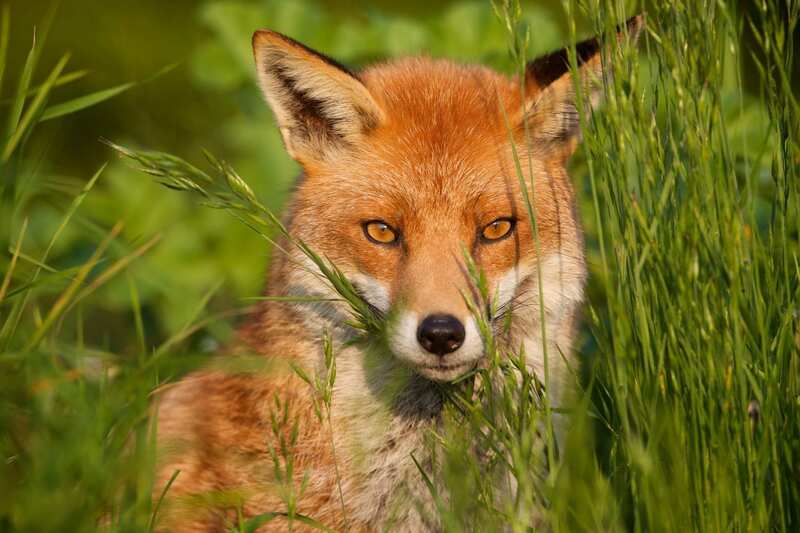 Foxes have a long and bloody history of persecution in Britain and worldwide. One of the most famous examples of this is fox hunting. Originating in England in the 16th century, fox hunting was the pursuit of quarry, traditionally red foxes, by hounds and people on horseback. Criticised as brutal, unnecessary and an ineffective control measure, or in Oscar Wilde’s more florid terms ‘the unspeakable in pursuit of the uneatable’, hunting was finally outlawed in 2005. However, loopholes and difficulty in policing this law means that fox hunting in vari ous guises continues today. Foxes are also trapped, snared and shot, especially if they stray onto farmland. They have a reputation as chicken-killers and any poultry left unprotected at night is at risk of being snatched. It is a mistaken belief that they will kill a whole coop of chickens yet eat only one: in fact, they are neither malicious nor wasteful and are acting only as their nature dictates: trying to feed themselves and their families with available prey. When they can they will cache any excess kill. Fox encounters come with a particular thrill, whether it’s an orange flash of that distinctive brush disappearing into woodland undergrowth or their almost supernatural bark echoing through a crisp, cold night and we are lucky to share our space with such magnificent creatures.